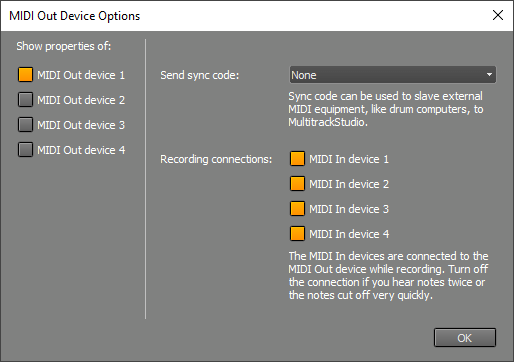 The MIDI Out Device Options window (available from the Studio menu's Devices window) determines the behavior of the MIDI Out devices, and consequently the External MIDI Instruments. The Send sync code section specifies the type of sync messages sent over the MIDI Out Device. This can be used to synchronize hardware or software sequencers with MultitrackStudio. The available options are None, MIDI Clock, MTC 24 frames/sec, MTC 25 frames/sec and MTC 30 frames/sec. The Recording connections section defines the way MIDI In and Out devices will be connected when recording MIDI. By default, events received by the MIDI In device will be send to the MIDI Out device that's being used by the recording track. This is fine if you're using an external 19 inch synthesizer module or an onboard soundcard synthesizer. However, it can cause problems if you're using a MIDI keyboard with built-in sounds that is connected to both the computer MIDI In and Out device (all notes may be triggered twice). This can easily be solved by unchecking the corresponding button.